Thanks, B, for your beautiful guest post. Thanks for keeping my grounding cord plugged into the center of the earth while the nurse was digging around for a vein on my hand to start the IV. And for reminding me to meditate when I had the chance. And for taking me to Whole Foods afterward. And for still being here in my apartment on work calls while I’m on the couch. So glad you could be there today and I love you, too! This morning went very smoothly. I felt anxious–not about the procedure but about the numbers. I had slept fitfully, dreaming of accidentally eating and having the hospital tell me I’d have to come back the next day. I was sleepy, dehydrated, hungry. But it was a gorgeous morning, and my sister texted me, “Ready to rock.” She walked out of her house with both arms in the air in a victory pose. She seriously brings the positive! We checked in, gown, hairnet, IV. The anesthesiologist was very enthusiastic and acted like I was an overachiever for having a good heartbeat and no obstructions in my airways. She said I’d go into deep sedation and if I was too conscious I could ask to go deeper. They led me into the room, kept dim for the eggs and embryos which do not like the light. I laid down with my legs up on knee stirrups and the nurses said they liked my striped knee socks. I told them that they were from my other sister, the one not waiting outside but on the other side of the country, so I had my sisters represented. They thought that made sense on such a “good luck-y” kind of day. The anesthesiologist had me confirm my name, birthday, why I was there, and any allergies to meds, and then I felt a warmth start in the center of my body and spread outward. She said the next one would be spicy going into the vein, which it was, but the next thing that happened was total sleep. I woke up maybe 45 mins later feeling velvety. I asked the nurse how many they got and she said 18. I didn’t really process or believe it, given my hazy state of mind. I asked maybe one, maybe two more times. 18. Eventually, after some apple juice and crackers, I got up and went to the bathroom and had a big 18 written on my palm. So, 18! A big upgrade from the 12-13 forecast on the phone by Dr. Tran yesterday. Tomorrow, I’ll get the fertilization report and will talk to Dr. T. about our next steps–all my options are open. The eggs are being fertilized RIGHT NOW. Please send love over at Sutter and Divisadero! 18! Look those blooming tulips! So what’s next in terms of timing and what to expect? I mean expect during the process. Wow, 18!!! That’s fabulous! 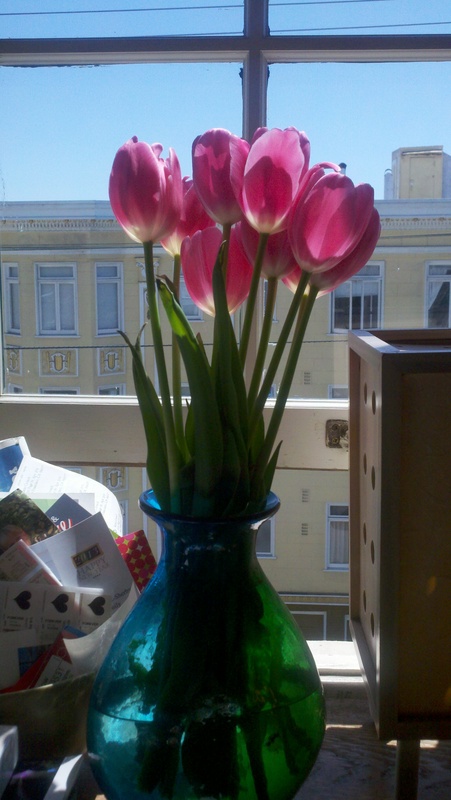 And the blooming tulips seem very auspicious. Sending lots of love to your eggs, may the grow strong & mighty!